I am pleased to send you my Session Wrap Up e-newsletter. This e-newsletter features events and legislative activities during the Session Week of June 4, 2018. 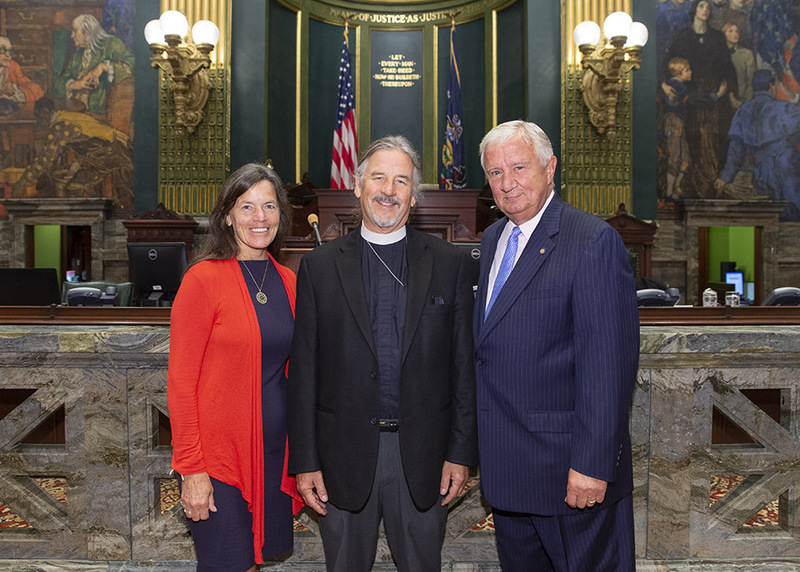 I was pleased to welcome Reverend Joseph P. Baird and wife Kathy to the State Capitol on Tuesday. Reverend Baird, who serves the St. Peter’s Episcopal Church in Blairsville opened the day’s Senate session with prayer. Senate Bill 1003 will ensure that EMS agencies are properly reimbursed for their services when called out to provide care. Currently, insurance companies and Medicaid are only required to reimburse EMS organizations for services when they include transportation to a hospital. There are cases where crews respond to a scene to provide care and treatment, but transportation is unnecessary or refused. Not every case requires hospital treatment or in some cases the patient is reluctant to seek further treatment. That means that these responders can be denied payment by insurance companies and by Medicaid. That’s just not fair. There are costs incurred and man hours spent by these organizations. Senate Bill 1003 will ensure those organizations are properly reimbursed for their services. I first became a strong advocate for Pennsylvania’s volunteer firefighters and EMS crews when I served as Chairman of the Senate Veterans Affairs & Emergency Preparedness Committee more than 10 years ago, particularly when we worked to implement the recommendations of the SR 60 Commission. Over the ensuing years, the Legislature has considered and passed a number of measures intended to support our first responders. Senate Bill 1003 is another step in that effort. On May 24, the House unanimously approved House Bill 1013, a measure similar to Senate Bill 1003 in that it requires insurance company reimbursement for non-transport EMS cases, but does not include the Medicaid component. My bill has the same intent, but takes an additional step and improves upon it by including Medicaid reimbursements. That further levels the playing field and provides greater support for Pennsylvania’s EMS crews and the good work they provide for our citizens. On Wednesday, Senate President Pro Tempore Joe Scarnati appointed me to serve on the Senate Labor & Industry Committee to fill a vacancy created by the resignation of Senator Scott Wagner. I will continue to serve as Chairman of the Senate Banking & Insurance Committee and as a member of five other Senate committees: Environmental Resources & Energy; Labor & Industry, Law & Justice; Rules & Executive Nominations; and State Government. I am also a member of the PENNVEST Board of Directors, an independent authority that provides loans and grants for water, sewer and storm waste projects across Pennsylvania. The Senate unanimously approved legislation on Wednesday that will create a new threat monitoring system to help reduce school violence. The Safe2Say Program, as created by Senate Bill 1142, would allow anonymous reporting of threats regarding unsafe, potentially harmful, dangerous, violent or criminal activities in schools. The bill now goes to the House of Representatives for consideration. The state Attorney General’s office would create the system, which would accept anonymous tips through a hotline, online or an app. The Safe2Say Program is modeled after a similar system created in Colorado – the Safe2Tell program – following the tragic school shootings at Columbine High School in 1999. Since its inception, Colorado authorities have received more than 30,000 reports of potentially dangerous situations. At least five other states have created similar programs. The Senate unanimously approved legislation on Tuesday that is aimed at helping courts provide better treatment options to defendants addicted to opioids. Senate Bill 922, which creates the Court Assessment for Non-narcotic Medication Substance Abuse Treatment Program, is one of a number of measures in the General Assembly that address the growing opioid epidemic. The program is intended to encourage the use of FDA-approved non-narcotic medications in conjunction with comprehensive substance use disorder treatment programs. The use of long–acting and non-narcotic medications has proven to reduce a person’s need for treatment to approximately six to 12 months. The Senate passed a package of bills this week that will provide savings for many Pennsylvania municipalities and save taxpayers’ money. Three bills — Senate Bill 771 (boroughs and third-class cities), Senate Bill 772 (first-class townships) and Senate Bill 773 (incorporated towns) — provide for concise publication of required annual financial reporting information, thus providing savings for those municipalities. Three additional bills — Senate Bill 947 (boroughs and third-class cities), Senate Bill 948 (first-class townships) and Senate Bill 949 (incorporated towns) — increases the threshold for requiring public advertising for bids from $1,000 to $2,000 when those municipalities sell personal property. The Senate unanimously approved legislation on Wednesday that will help reduce fraud in the Supplemental Nutrition Assistance Program (SNAP) – commonly known as “food stamps” — and hold perpetrators accountable. Senate Bill 1127 would create a new penalty for the fraudulent trafficking of SNAP benefits in an amount greater than $2,500. Violators would be required to pay restitution of up to three times the amount of fraud they committed. The bill stems from a case uncovered last year by the Office of State Inspector General in which a Harrisburg restaurant traded drugs for EBT cards and bought thousands of dollars of supplies from a food wholesale club to be resold for profit. Senate Bill 1127 was sent to the House of Representatives for consideration. Four additional bills were approved by the Senate and sent to the House of Representatives this week. House Bill 564 requires students to pass a civics test as a condition of high school graduation. The bill returns to the House for concurrence on Senate amendments. House Bill 653 provides for an accelerated foreclosure process for vacant and abandoned property. The bill returns to the House for concurrence on Senate amendments. Six bills received final legislative approval this week and were sent to the Governor’s desk for enactment into law. Senate Bill 234 establishes the Property Assessed Clean Energy program. House Bill 352 reduces the period of time needed to acquire a title through adverse possession under specific circumstances. House Bill 566 provides for the suspension of services by a contractor or a subcontractor if timely payment is not received in accordance with the terms of a construction contract. Senate Bill 880 allows trailers up to 102-inch wide on Pennsylvania highways. House Bill 1793 creates the Pennsylvania Commission for the United States Semiquincentennial. House Bill 564 requires students to pass a civics test as a condition of high school graduation. Senate Bill 859 establishes a grant program to assist counties in diverting individuals with mental health problems from the criminal justice system. Senate Bill 860 enacts the Criminal Justice and Addiction Treatment Act. Senate Bill 884 makes changes for guardianship in Pennsylvania. Senate Bill 922 creates the Court Assessment for Nonnarcotic Medication Substance Abuse Treatment Program. Senate Bill 1003 requires insurance companies and Medicaid to reimburse emergency medical services agencies for services provided even when transport to a hospital does not take place. The Appropriations Committee approved three bills on Wednesday. Senate Bill 22 provides for an independent Redistricting Commission. The Consumer Protection & Professional Licensure Committee approved three bills on Wednesday. House Bill 1343 authorizes professional and occupational licensing boards to allow carryover of excess continuing education credits. The Senate Finance Committee approved House Bill 1460 on Wednesday. The bill imposes additional reporting requirements on the Public School Employees’ Retirement System and the State Employees’ Retirement System. The Senate Judiciary Committee approved 11 bills on Tuesday. Senate Bill 1043 clarifies that criminal records may be used to justify an adverse employment decision only if the records are relevant to the employee’s suitability for the position. Senate Bill 1129 addresses paternity issues. Senate Bill 1134 establishes sextortion as a specific criminal offense. Senate Bill 1175 allows the use of a subpoena to obtain information from a social media account to investigate a threat made against a school. It also requires district attorneys and judges to review the disciplinary records of any student being prosecuted for making a terroristic threat. House Bill 1216 provides that any law enforcement officer, humane society police officer, animal control officer or emergency responder who rescues a dog or cat from an unattended vehicle will not be liable for any damage caused by the rescue. House Bill 1644 establishes the Collaborative Law Act. House Bill 1738 allows trained and certified non-municipal police officers the same jurisdictional flexibility as municipal police officers. The Senate Labor & Industry Committee approved two bills on Tuesday. Senate Bill 1157 gives the Auditor General the authority to audit the Statewide Radio System.